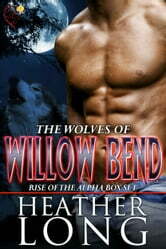 Discover the Wolves of Willow Bend. 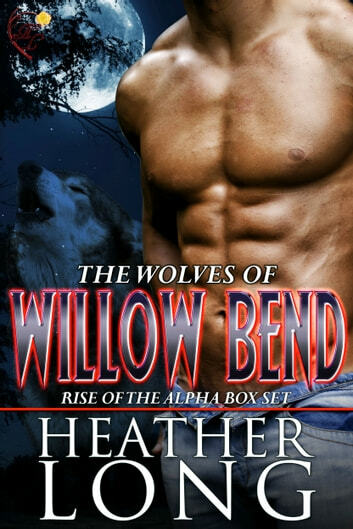 Includes: Wolf Bite After a dominance challenge ended with his parents deaths, Mason left Willow Bend and his pack behind, choosing instead to live life on his own terms…as a Lone Wolf. A wanderer, he keeps his life simple and carefree until an unexpected encounter brings him face to face with his tragic past and the woman he always adored. Determined to get her out of his blood, he teases her into an easy one-night stand…but one taste will never be enough. Adopted as a young girl, Alexis Huston lived on the fringe of pack life. She’s never been strong enough, fast enough, or pretty enough—except to Mason, but then he left her. Allowed her freedom as an adult and sworn to keep the pack’s secrets, she’s struggled to fit into the ‘human’ world. A chance meeting turns her hard-won life upside down. She is left with two options—she can tell the only wolf she’s ever loved that she’s carrying their child…or she can protect him, keep the baby a secret, and run. Caged Wolf Triplets, the Buckley brothers were inseparable until everything went wrong one violent, bloody night. A.J. Buckley, the eldest of the trio, faced a human trial for a brutal murder. Found guilty, he was sentenced to twenty-five to life. Without argument or regret, he accepted the sentence. After six years in prison, A.J.’s conviction is overturned on a technicality and he returns to Willow Bend to face a new Alpha and fresh charges. Vivian Knox was the only witness to the murder. She refused to testify in the human courtroom and spent a year in prison on contempt charges. Once released, she worked tirelessly to free A.J., finally locating a loophole in the case against him. Satisfied with his freedom, the last thing she expected was to be kidnapped to the back of beyond where another judge demands she testify to what she saw that night. This time, contempt is the least of her problems. Only four people know exactly what happened that night and none are talking. When pack law threatens Vivian, A.J. must stake his claim, but his wolf might be too damaged to help him… Wolf Claim Gillian Whitford, darling of Willow Bend, brings out the protective instincts in all the dominants, but none more so than Owen Chase, the pack’s Hunter. A loner by nature and calling, Owen spends less time with his pack mates and more time on the borders of their land. Not even the change in the Alpha and the swearing of a new oath kept him around long. Winds of change still drift through Willow Bend as they adjust to their new Alpha. When the Hudson River pack requests a fill-in healer to replace their own, Gillian, journeymen apprentice to their Pack healer, is the obvious choice to help. Owen forbids her to accept, but the sweet natured wolf rebukes his selfishness and volunteers anyway. Risking a challenge, Owen faces off against his Alpha to appeal her decision and finds himself charged with her safety. Now, the loner will be escorting one of his pack’s most precious into foreign lands. He’s all that stands between her and a dozen potential threats…and if he doesn’t stake his claim, he may lose more than his heart. What Part of Marine Don't You Understand? Max & Milo Go to Sleep! I love this series. Strong wolves, a paranormal romance and yes, a worthy mate found in each story. Another series to follow! Thank you Ms. Long! it was better than I thought it would be. I will be reading more of Heathers books. Reading about strong bonds is really worthwhile. I’ve enjoyed this series of books immensely. Even when danger surrounds them, the mated couple are able to survive and become even deeper in love. The way the story unfolds is carefully crafted so as to never lose your interest is masterly . . . What a great read!! Too many typos to make it an easy read for me. I find that detracts from the stories.